Highly effective for dull, grey skin that hasn’t been protected from the sun or which hasn’t been benefited from a regular care regime. 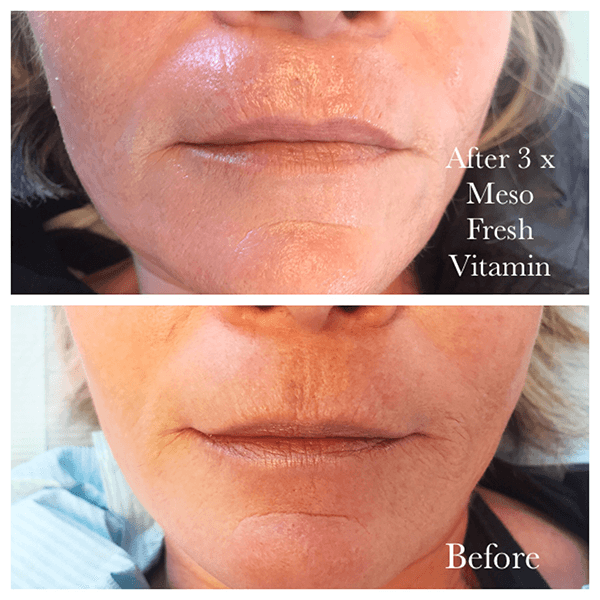 MESO FRESH VITAMIN is an important product within mesotherapy that stimulates and revives tired skin. The product is a good choice for treating dehydration, wrinkles and sun damage. Treating with MESO FRESH VITAMIN helps achieve a good level of cellular hydration and good biochemical and biological architecture. Thanks to the content of hyaluronic acid, it is also recommended for use around e.g. the eye area, which will lead to significant improvement after just 1-2 treatments. MESO FRESH VITAMIN consists of natural substances of a high quality, which are therefore easily absorbed by the skin. This gives fast, visible results. MESO FRESH VITAMIN is gentle and is often used together with other treatments. The product does not prevent ageing, but delays the process significantly. Through treatment, the skin gains a fresh and youthful glow, which is already visible after the first treatment. MESO FRESH VITAMIN is rejuvenating wellbeing at its best. The treatment is a targeted health boost for the skin, and with its wrinkle-reducing properties, the product is also well suited to patients who smoke and who have not followed a skincare regime. 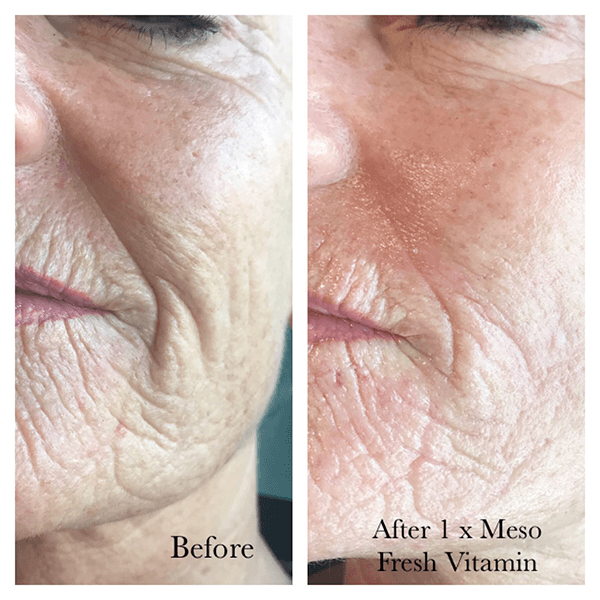 Just like several other mesoskinline products for professional treatments, MESO FRESH VITAMIN contains hyaluronic acid, which is produced naturally in the body and is found in tissue and body fluids in all human beings. The molecule has a unique ability to bind large quantities of moisture in the skin. 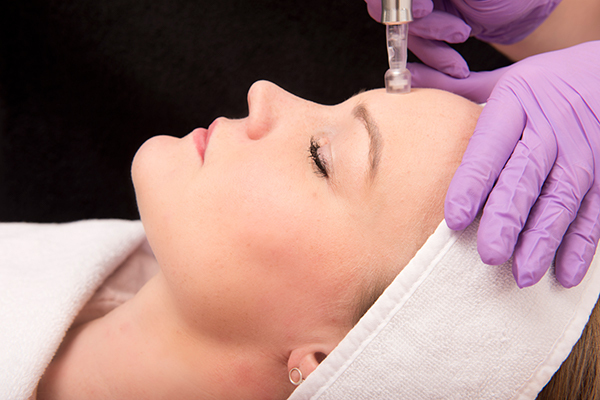 Hyaluronic acid's hydrating properties are particularly beneficial for wrinkle reduction. For minor wrinkles, such as around the eyes, a single MESO FRESH VITAMIN treatment is sufficient, while deeper wrinkles need repeated treatments. 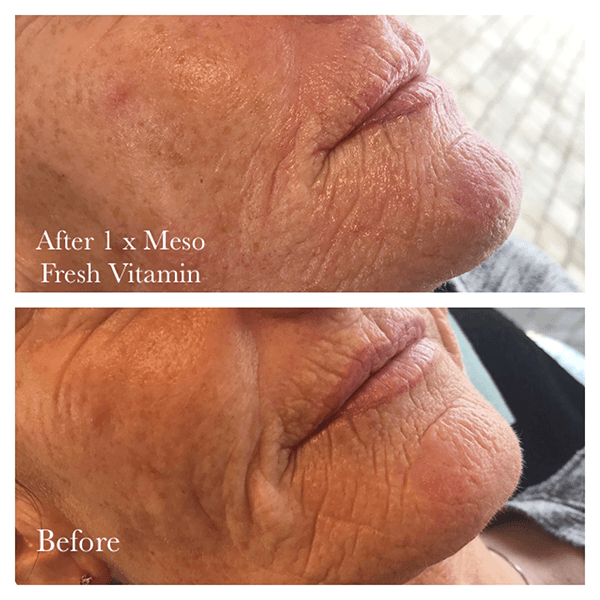 MESO FRESH VITAMIN is both gentle and effective and is suitable for multiple skin types, damage and signs of ageing, and the treatment improves both collagen fibres and micro-circulation in the skin. The result is a firmer and a more supple skin that radiates health. The product has no side effects, allowing you to treat larger areas simultaneously without any discomfort. The ingredients contained in MESOskinline products are all approved remedies, which have been selected in accordance with general medical practice. They are packed in clinical conditions in practical vials and disposable ampoules to avoid waste or oxidation. The products are ready to use and thereby quick and easy to apply in a busy working day. MESO FRESH VITAMIN is not recommended for pregnant women, patients with acne or severe skin problems.